One particular blade that has been flying under the radar for several years now is the Falcon from Ontario Knife Company (OKC), and its full of many welcome contradictions. In lots of ways the Falcon, introduced in 2011, is a whole collection of opposing features in knife terms which might be responsible for the Falcon’s general anonymity in survivalist circles. 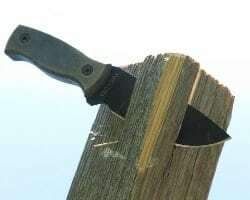 For starters, the company propaganda for the Falcon describes it as the first knife of the Ranger line which, “is a set of combat and survival knives and tools designed and built for combat deployment in the most unforgiving terrain on the planet.” Yet OKC suggests that, “the Ranger Falcon hunting knife is perfect for small or large game.” And Ontario knows knives. With company roots as far back as 1889, OKC has manufactured cutlery in America since Benjamin Harrison was POTUS.